Dark Masters is an epic fantasy adventure sequel set in Nevaeh, the future of Earth’s western civilisation. It’s about young psychic-warriors Areenna and Mikaal, whose quest to save Nevaeh can only be achieved by a perilous passage to the Frozen Mountains to learn of an ancient secret. 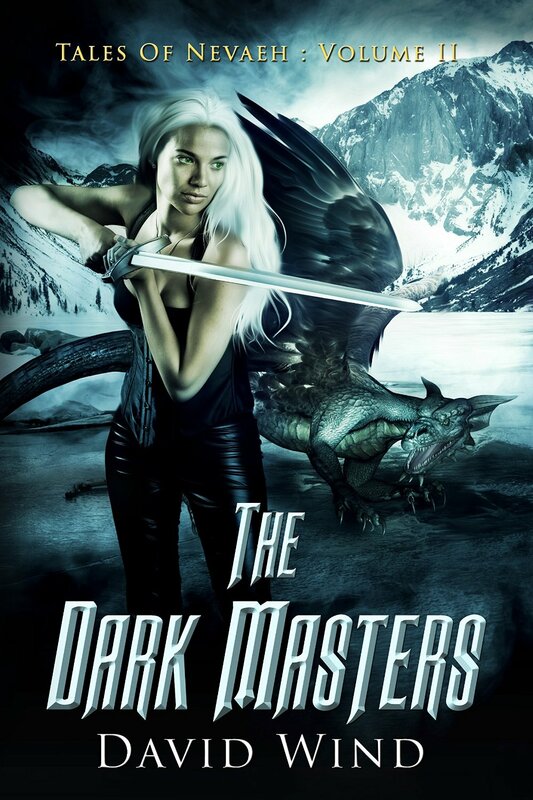 Much of Dark Masters followed a similar formula to its prequel Born to Magic, where Areenna and Mikaal are hunted by unseen or not easily perceived dark forces. These forces test their magical and physical defences, attempting to delay their quest long enough for the Dark Masters to invade. On their adventure, doubts about their abilities and purpose will surface, the most remarkable being why Mikaal has the psychic abilities of women. In comparison with Born to Magic: David Wind has an increasingly strong grasp of Areena and Mikaal, their emotional and psychic connection, as well their role. High King Roth and High Queen Enaid were included, which was comfortingly familiar and also pleasingly different because they were thrust more often into the plot and action. I liked the greater focus on aouteums, which are like animals that have magical bonds with psychics and are telepathically communicated to, sometimes with an ‘asking’ for requests. It was a clever idea, and warmed them to me. There were some stylish sword-fighting scenes and skirmishes against enemy pawns. I especially liked the magical clashes between good and evil, which were visually atmospheric and convincing. Yet, I would have liked a bit more of this action throughout. Perhaps more so than Born to Magic, I found Dark Masters to have more emphasis on symbolism, with actual symbols and prophetic fore-tellings. In a way, I interpreted it as being that while religious extremism can be a pervasive force of evil, belief systems can unite the ‘good’ Nevaens through ancestry, common purpose, and tradition. Sometimes the storyline captured me so fully, that I forgot of its link to modern-day terrorism and extremism. The author must be applauded for a series of tales that read like they actually happened; they’re that believable! When the reader learns more about the Dark Masters and of the origins of Nevaeh, the writing and adventure becomes absolutely sensational. As a reader, I was swept into the battle, and there was magic galore. David Wind sets a spectacular final scene, tying the characters, plot, battle, and the greater truth of Nevaeh into a solid, pulse-pounding finale.